Facts, research, news and topics linked to the historical novels for kids by Caroline Lawrence: The Roman Mysteries, The P.K. Pinkerton Mysteries and more! 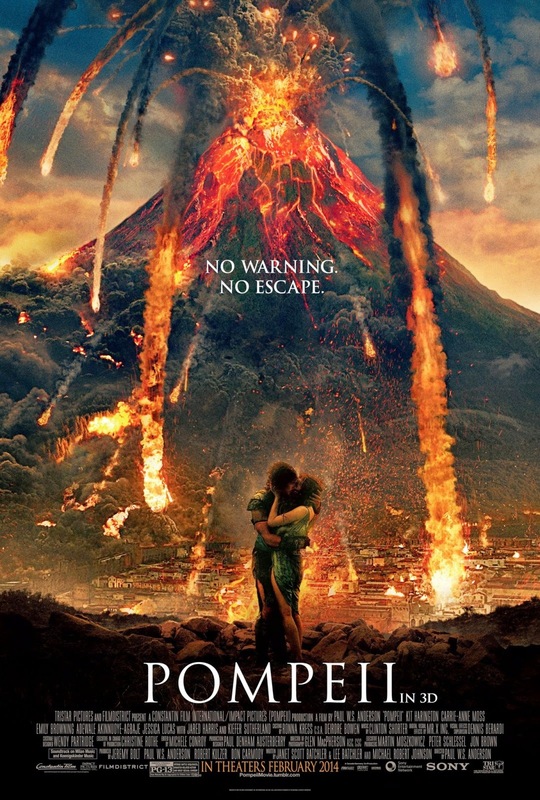 I will start by saying I enjoyed Pompeii the 2014 movie hugely and recommend it highly, especially to children aged 12 and up. It is obviously a labour of love and the film makers put a lot of research and thought into the look of the film. The sets are wonderful and the costumes also fun. But writing historical fiction is always tricky and adapting it for big or little screen even harder. You can get 95% right but people will spot the 5% you got wrong. So here is my 5%, the dozen or so things that I consider to be bloopers. Hopefully, future makers of Roman movies, books or musicals will take note of these "mistakes". 1. The forearm handshake is pure Hollywood. 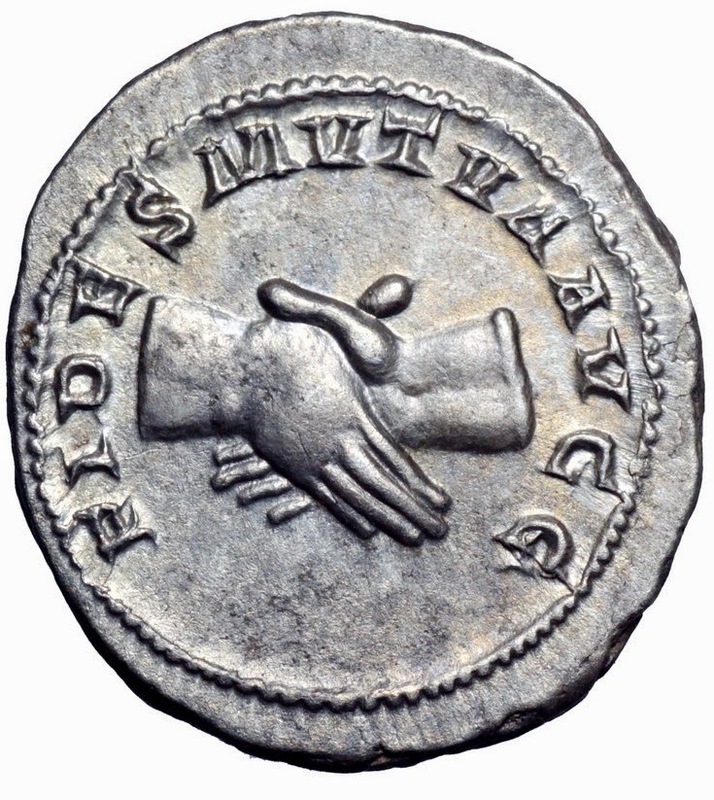 We know from coins, reliefs and vases that Romans shook hands, or at any rate clasped hands, just as we do today. For more proof that this handshake is totally bogus, go to my Greek and Roman Handshake Pinterest page. 2. The phrase: "Those of us who are about to die salute you" is only attested once, in an account of a mock sea-battle during the reign of the Emperor Claudius. It was spoken by condemned criminals who all knew they were fated to die. 3. Highborn girls probably wouldn't have run around Pompeii or any other Roman city without a bodyguard and without their heads covered by a palla. 4. The film-makers show the famous stepping stones in Pompeii but then have the characters walk in the street. Some archaeologists think the fountains were constantly overflowing into the streets to wash away quantities of horse manure, etc. You would not want to walk in the streets of Pompeii, especially the ones open to horse and mule traffic. 5. Vesuvius has gone off many times since that first famous eruption in AD 79. Each time great ash clouds still rise into the air. 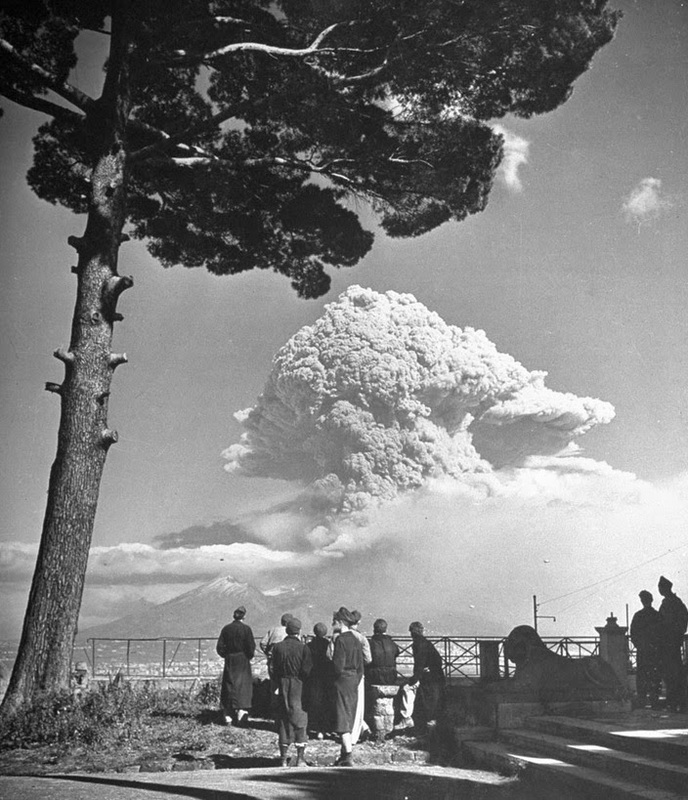 This type of eruption is called a Plinian eruption after Pliny the Younger, who first described it and Pliny the Elder, who lost his life investigating it. 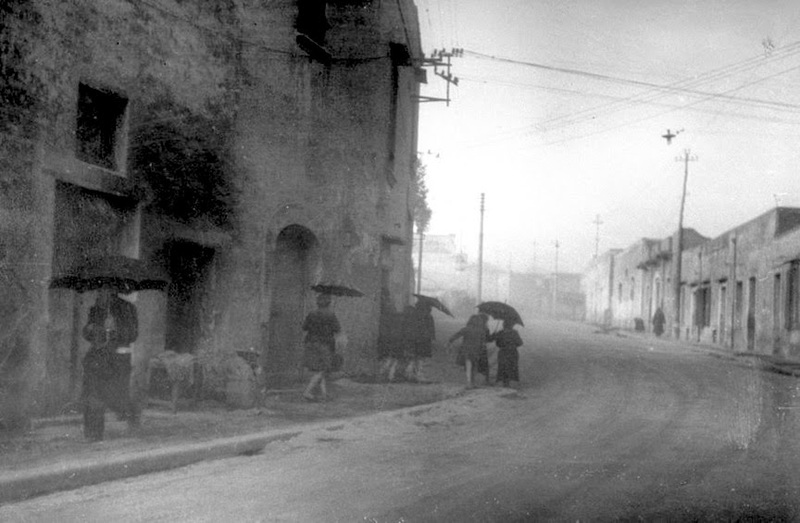 When Vesuvius erupts, Neapolitans just open their umbrellas and wait it out. Apart from the earth tremors that brought down some buildings, the main danger of the AD 79 eruption was from a succession of pyroclastic surges of white hot ash, which was well-depicted in the film. There were no flaming boulders, just showers of tiny pumice pebbles called lapilli. However, the exploding boulders invented by the film makers are great fun from a storytelling point of view. 6. As in the movie, the sea did indeed recede and then became unviable because of a scum of debris and lapilli floating on the top and rubble on the coast. However there was no "reverse tsunami", though this makes for some exciting visual effects. 7. People in Pompeii had about 12 hours to get out of town. The volcano started erupting around noon and the first pyroclastic surge did not occur before midnight. Those people who went south around the Capo di Sorrento probably survived. I have walked it myself: it takes about four hours from Castellammare di Stabia to Vico Equense. From Pompeii would be doable in 6 to 8 hours. 8. The "frozen bodies" featured in the movie are inspired by plaster casts first made by the Italian excavator Fiorelli about 150 years ago. When the pyroclastic surges reached Pompeii, the heat was just enough to kill people instantly without burning their clothes or flesh. The ash fell and buried the bodies. Over time the ash became hard while the bodies decomposed. After two thousand years, all that was left were "people-shaped holes" in the hardened ash. Using the principle by which casts of famous sculptures were made, Fiorelli filled the cavities left by corpses with liquid plaster, let them dry and then chipped away the hardened ash. 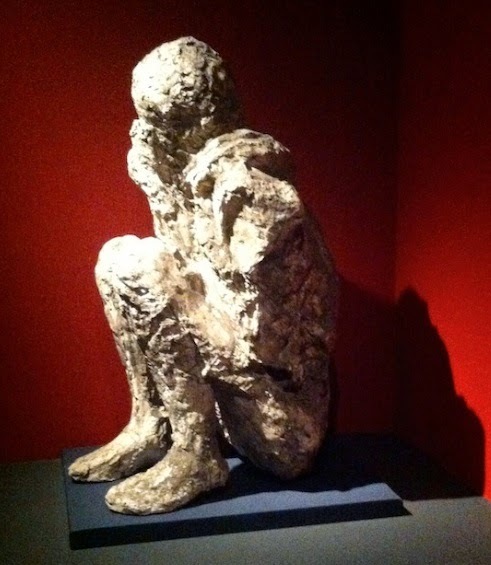 The "ancient Roman bodies" in positions of agony and despair electrified the world and put Pompeii on the map. 9. Fissures did not open in the earth and bits of cliff did not fall off but there probably were steaming vents as there are today in Solfatara, a shallow volcanic crater in the Campi Flegrei (flaming fields) near Naples. 10. Prior to the eruption, the crater was probably not full of lava. Spartacus and his men camped in it a century earlier. When the volcano erupted in AD 79 a whole new peak was created and the earlier higher peak, Mons Somma, collapsed. Today you can clearly see both the old peak and new: Mons Somma and Vesuvius. 12. Titus was not a vindictive Emperor as hinted at in the film. His younger brother Domitian was the one who executed dissenters and confiscated their property. On the contrary, Titus visited the area of destruction soon after the eruption, and provided financial aid out of his own funds. You can read Pliny the Younger's two accounts of the eruption online and see for yourself. A brilliant detailed scholarly commentary starts HERE. 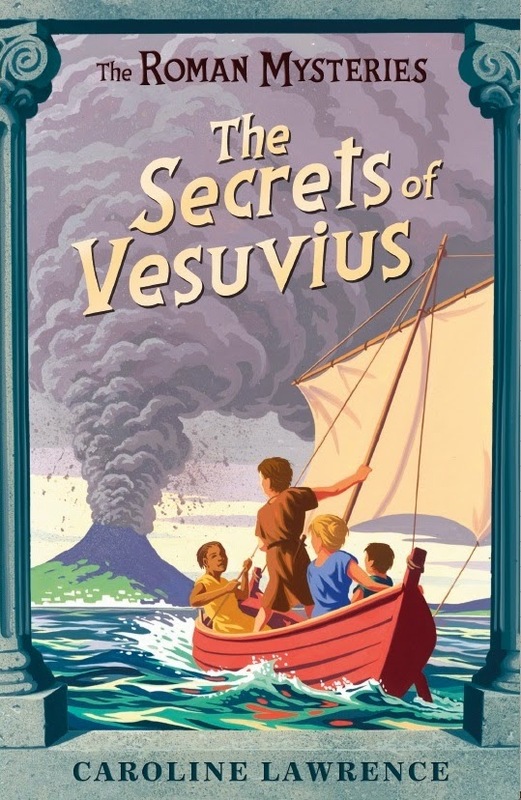 Kids will enjoy my second Roman Mystery, The Secrets of Vesuvius, which is closely based on Pliny's letters. You can watch an adaptation of the Roman Mysteries books including The Secrets of Vesuvius on iTunes. And yes, there are bloopers in the filmed depictions, too! Hi Ms. Lawrence! Would just like to ask if the people of Pompeii didn't really consider themselves Romans, as emphasized repeatedly in the film? Thank you! I imagine some did and others didn't! This is a surprisingly old-fashioned disaster movie. So what's with the sponge-stick? Follow Caroline's board The Roman Quests on Pinterest.